Medical Education has gone through a lot of uncertainties in the year 2016. The recent controversy surrounding the NEET exam has left the medical aspirants spellbound and bewildered. The introduction of NEET exam has been criticized throughout the nation owing to short notice period and availability of incomplete information. 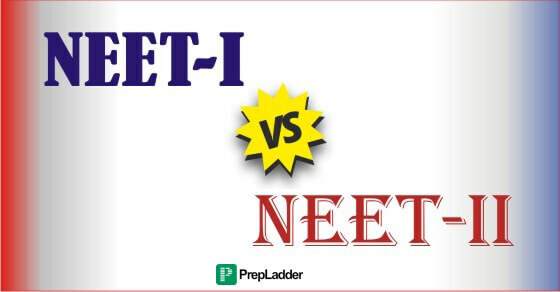 This article will share a comparative analysis of NEET I and NEET II. The exam, which is now the sole basis for admission to medical colleges across the country, has been brought into force by the Government with the consent of the Supreme Court in order to safeguard the sanctity of medical profession and remove corruption in the admission process. In response to the petition filed by the MCI, the Supreme Court gave its consent to conducting a single common entrance test for admission to medical and dental colleges across the country. For the session 2016-17, SC gave its consent on conducting the NEET exam over two phases. Consequently, NEET I was conducted by the CBSE on May 1, 2016. Later on, a plea was filed by the state governments to allow them to conduct separate entrance exams for admission to MBBS and BDS courses for the session 2016-17 which was rejected by the Supreme Court. Later on, the Central Government promulgated an ordinance which exempted the State Governments from the mandatory requirement of conducting NEET. NEET II was conducted on 24th July 2016. This section was toughest among all the sections. It comprised a large number of numerical problems which were tough and time-consuming. 40% of the questions were tough, 40% were of moderate difficulty level while 20% were easy. The paper comprised an equal number of questions from Class 11th and 12th syllabi. Concepts were tough and calculations were lengthy. Some concepts were beyond the scope of the NCERT. 15 questions were from Class 11th syllabus and 30 questions from class 12th syllabi. A Majority of the questions were beyond the scope of the NCERT. More standard in comparison tp Phase I exam. Some questions were out of syllabi and beyond the NCERT scope. Numerical problems were easy and based on direct application of formulas. The exam omitted some chapters of the syllabi and the Organic portion was difficult. The paper was easier in comparison to the previous year. Some of the questions were beyond the scope of the NCERT. This Section was well-balanced with equal emphasis to Class 11 and 12 syllabi. All the important chapters were covered in the exam. The paper contained a mixed bag of simple, moderate and difficult questions. Some questions were beyond the scope of the NCERT. Here we share the overall analysis of each section of the NEET I and NEET II exams. More standard in comparison to Phase I exam. Stay Tuned for the latest updates on NEET !